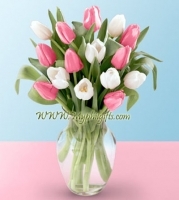 Send a springtime greeting to brighten the day with 8pcs pink and 7pcs white tulips. A terrific festive greeting, our fancy Dutch tulips come in a mixture of pink and white stems. Your fresh cut tulips will arrive wrapped and ready for the recipient to arrange in their own special way.